On the 19th January 2018, during plenary on the floor of the Nigerian House of Assembly on the issue of the alleged killings and clashes between herdsmen and farmers in the country, Hon. Aishatu Jibril Dukku representing Dukku/Nafada Federal Constituency of Gombe State threw her weight behind the herdsmen, saying “their cows are important to them and that the herdsmen value the lives of their cows more than their own lives”. Thus, Cow Lives Matter! While the title of this piece draws inspiration from the #BlackLivesMatter movement in the United States of America, the work is focused on the crisis engulfing the middle-belt area and spreading across the Nigerian federation. While the Global Terrorism Index in 2015 named the Fulani Militant group as the fourth deadliest terror group in the world behind Isil, Al-Shabab and BokoHaram, after 1,229 killings were allegedly linked to the group in 2014, it has become increasingly difficult to get to the root of the crisis as both the attacks and the opera- tion of the attackers are shrouded in secrecy. The piece was created for the International Performance week of the Lagos Dance Gathering. 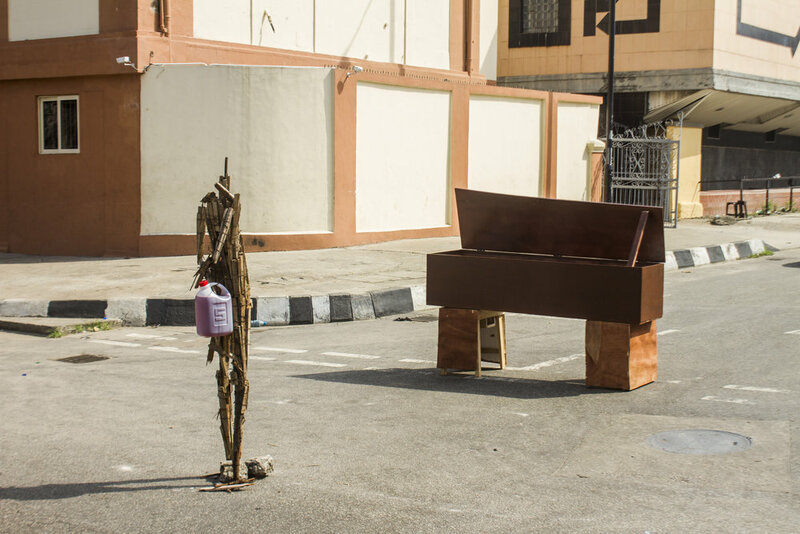 The installation is symbolically installed in front of the National Morgue on Broad Street in Lagos Island. The work becomes both a commentary on the on-going killings on the herdsmen crisis across communities in Nigeria, and a burial ceremony for the thousands of people who have died in the process. This becomes more important in a country where the dead are often not acknowledged and the government doesn’t declare national mourning on the victims of these attacks. #CowLivesMatter is both an installation and a performance piece. The installation consists of a sculpture piece wrapped in a Nigerian flag placed inside a coffin filled with “blood”. A sound piece, which contains an excerpt from audio recordings at newspaper stands on the crisis, is installed inside of the coffin. A sculpture piece is holding a 5-litre fuel keg filled with some “blood” while 5 other grave signs are installed with sand, tyre. A final piece in the work is the “Condolence Register” created for the viewers to put down their commentary on the state of the nation. As a performance piece, #CowLivesMatter becomes a material for other performers during the festival to use for their various projects.